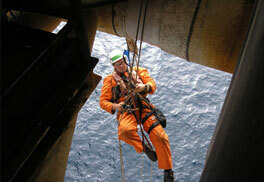 ROPETEC was formed in 1991, specialising in Rope Access and Accessibility - offering Inspection, Maintenance, Industrial and Civil Solutions as a result of the recognized need for specialised Inspection and Maintenance Services in elevated, almost inaccessible locations. Our uniquely highly skilled, experienced Maintenance, Inspection and Riding Crews, are able to mobilise with minimal delay, from their various offices around the globe to carry out varied works with the skill and expertise of conventional contractors.The company began trading as Ropetec in 2000 and have offices and associated companies situated around the globe, with the Operations Office located in Cape Town, South Africa. Inspection and survey of':- Steel structure, pipe work , concrete, electrical fittings / systems, glazing and painting systems, tank and pipe internals , oil platforms (flare booms, masts, risers and splash zone areas) ships holds, voids and ballast tanks, masts, stacks. Repair and Maintenance to:- Concrete, paint system, steel works /welding joints, cladding, insulation, electrics, flare tips. 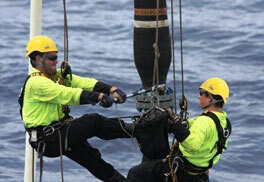 Electrical and Mechanical equipment, radio masts, navigation lights, video cameras. Paint systems including sophisticated epoxies and polyurethane, fiberglass, masonry, in tumescent and anti carbon coatings. Painting or Cleaning:- Tanks and pipe works ( internal and external), structure (steel and concrete), Ships holds, voids, stacks and masts. Gas fire detection systems, cable runs , ladder rackings, tray work trunking, hazard warning lights, earthing systems, module lighting. Splash zone work, riser guards, clamps , concrete repair, rigging, bold torqueing, cladding working, flare tip change outs, vent line replacement, cane cable greasing. Legs, columns, vessels, modules, large diameter piping.